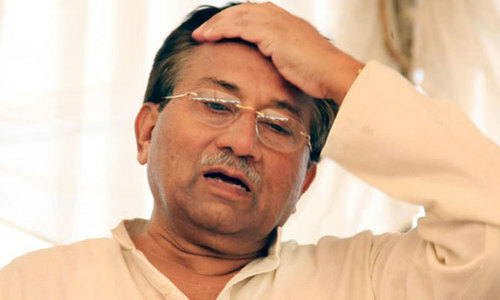 The Supreme Court (SC) on Thursday withdrew its directive allowing former dictator Pervez Musharraf to file nomination papers after he failed to appear for a court hearing today. Last week, the SC had issued a directive permitting Musharraf to file nomination papers for the July 25 general elections on the condition that he appear in person before the court on June 13 in Lahore to attend a hearing. The court had said that the former army chief's nomination papers will be received by the returning officer, but would only be considered if Musharraf appeared in person at the SC Lahore registry. Musharraf had then filed his nomination papers from NA-1 Chitral after the court's directive, but failed to appear in court yesterday. Chief Justice Mian Saqib Nisar then gave the former president until 2pm today to appear in person or face action according to the law. Musharraf's lawyer Qamar Afzal today pleaded that the former president plans on returning but needs more time to appear before the court owing to the "current situation [in the country]" and Eidul Fitr holidays. 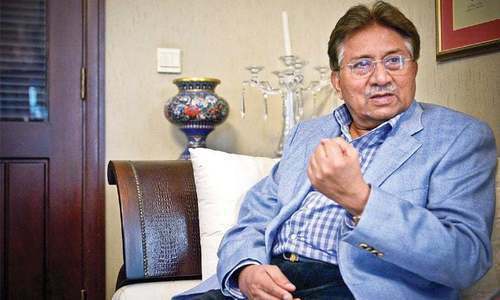 Adjourning the case for an unspecified period of time, the court took back its directive allowing Musharraf to file nomination papers and asked his lawyer to let the court know when he wants the case to be heard next. A four-member bench of the apex court, headed by the chief justice, was hearing Musharraf's appeal against his 2013 disqualification by the Peshawar High Court. Earlier in the day, the CJP had asked the deputy attorney general to find out if the former dictator was going to appear in court for the 2pm hearing. "The Supreme Court is not bound to Musharraf's terms," the CJP had remarked in yesterday's hearing, after the former president's counsel had insisted on blanket guarantees for his security. "We've already said that if Musharraf returns, he will be provided with security. We are not bound to also provide a written guarantee in this regard." "If he doesn't return, the scrutiny of his nomination papers will not be permitted," Justice Nisar had warned. Musharraf has not returned to Pakistan since leaving for Dubai in March 2016 on the pretext of medical treatment. Since the supreme court is taking actions and issuing executive orders directly, it is already exceeding its schedule. Pervaz Mushraff was given a chance to defend himself in the court, but he didn't avail the opportunity. So we are back to square one - another leader is in abroad and probably will stay there rest of his life, as he is afraid to face the music! Musharraf might have gone by the precept that "It is better to be safe than sorry" He might even have thought that this could be a plot to get him back in to Pakistan and then not let him leave again while he is tried for all the cases against him. Frightened man who is running from pillar to post fearing for his life. This is what happens to failed politicians of Pakistan. Check up on google search about Pakistan PMs and Presidents right from the time the country came into existence. The former commando just squandered a golden once-in-a-lifetime opportunity to exoneration himself from all the alleged cases of treason, imprisonment of judges, putting the constitution of the country on the back-burner etc. etc. in a fair, legal, equitable, moral, free and ethical fashion under due process of law and checks and balances. Kudos to the brave general! Mr Musharraf is an honest and sincere leader.For him,Pakistan is first.He must return back to Pakistan and face all the allegations.He must clear his name thru our courts and contest the elections. The purpose of the whole thing was to restore his national ID card and passport. That's it. Those of us who were hard upon CJP for allowing Gen to run for the elections must find the courage to admit our judgemental rashness. Sorry CJ. This is an intelligent decision by Musharraf. As much as I dislike him, I would suggest that he stays abroad and continues organizing presentations regarding strategic issues confronting Pakistan and the world. His expertise is in this area and he should focus on supporting Pakistan through this medium. The brave SSG commando is asking military and judiciary to provide him guarentees that he will be safe. While he was self appointed in charge of the country for nine whole years, he did not care how insecure Pakistan had become for the citizens. It is better for him to swing his back on foreign tunes in desi parties abroad than to return to the country he used to say comes first. And it will be granted. like NS case at NAB. Otherwise we will all question double standards. More time. Now that has a familiar ring to it. @Khalyee_Makhlooq : Just wow! You got a valid point. Why is everybody giving so much importance to him. Musharraf is an absconder and should be arrested. No need for CJP to waste time on him. Block his ID and Passport now. @k p rao, Google is not Wikileaks, you don't look for facts on google, its an information engine. @BK Brave! Some one hiding in Dubai and absconding from the court of law is a brave man? @BK is he really brave? if so why he is afraid to appear before court? @M1 Jamal if he is a honest person how he is living a luxurious life in Dubai. do u think he is only depending on his pension.? Since former President of Pakistan believes in his own country he should better attend the Supreme Court hearing. The Pakistan army is there sure to provide him with the necessary security. @atis brave man absconding if he is so brave why don.t he face the music. Musharraf is without a doubt the best leader since Ayub Khan. NRO was his biggest mistake. The ground realities during his days were 1000 times better than other grand looters, it's down right wrong to even compare President Musharraf with goons and looters like Zardari and Nawaz. Thank you President Musharraf for excellent governance. Pakistanis specially those who know economy and well educated know and understand your great contribution towards the well being of Pakistan. President Musharraf did excellent governance. Thank you President for you service in military and as a president. Great visionary leader all nonsense against him which now disqualified Nawaz is known for. Army gave Nawaz Politics entry now he blames army for everything. @Abdul Razaque Bibi was extremely brave. She loved Pakistan despite what her family had to endure. One of the most heartbreaking event of this subcontinent was her assassination.